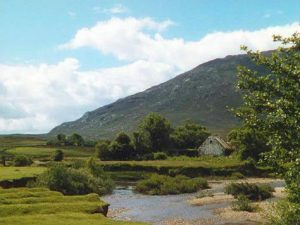 One of our posts featuring a photograph of John Wayne taken in Renvyle more than sixty years ago while filming the movie “The Quiet Man” prompted us to take a look and see what other locations from the movie were still to be found. There has been a long association between Ireland and the American movie industry in general and many well known stars were of irish descent, but in 1952 Ireland itself was not known as a location for making films and that is perhaps the reason why the John Wayne Classic directed by John Ford has earned a very special place in the hearts of everyone who has seen it, locals and tourists alike. 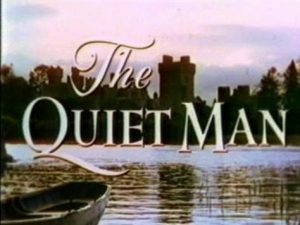 The Quiet Man would now be classified as a “Rom Com” or romantic comedy, but John Wayne’s performance as the returning émigré would put Hugh Grant to shame. 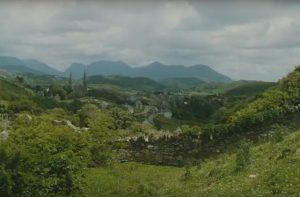 Director John Ford won an Academy Award for the movie, and the locations in the lush countryside of Connemara and South Mayo are a major part of the cinematography, and over the years these locations have been toured and visited by the many people who have become curious to see where this Classic Movie was filmed. 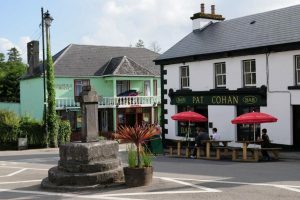 The village of Cong an the border of Mayo and Galway at the very top of Lough Corrib, is the most famous Quiet Man filming location as it represents the majority of the fictional Inisfree in the film. This village is virtually unchanged since 1952 and it is a delightful place to spend an afternoon spotting the locations of scenes from the movie. 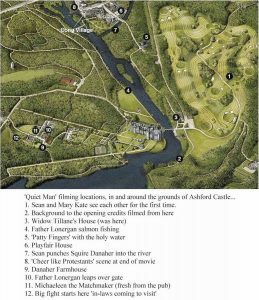 The grounds of Ashford Castle are used throughout the movie and for a small charge you can take a walk around the estate and its stunning gardens. The Castle is now a Luxury Hotel, and non residents are welcome to book for a delightful, ( slightly pricy) afternoon tea. Just on the Clifden side of Oughterard on the N59 there is a turn off to the left which is well signposted. 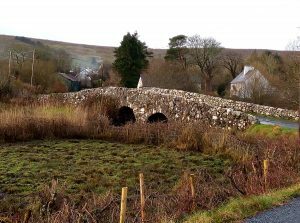 You can drive down here to where there is some parking and visit “The Quiet Man Bridge”. This bridge is in a stunning spot with a beautiful view up the valley toward the Twelve Bens Mountains and Boffin Lake. No one can resist the temptation to sit on the parapet for a photograph while trying to look like the Big Man himself. 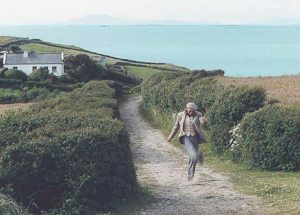 Lettergesh Beach in Renvyle is where the horse racing scene was filmed, and it has not changed one bit, as you can see from some of the photographs even the hedges are still the same. 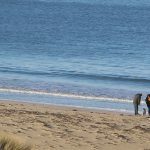 If you take the time to watch the scene in the film you can visit the beach and see how they pieced the shots together using the landscape of this unique beach. 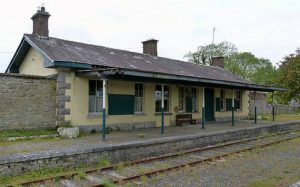 Ballyglunin Train Station. The opening scene of any movie is an important one and in The Quiet Man we see John Wayne roll into Irish hearts via the form of steam train at Ballyglunin Station. 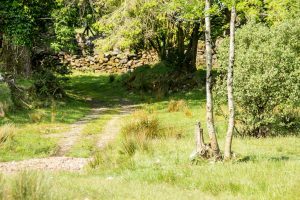 Maam Village: Just south of Maam village, which is close to Cong lie the remains of the Quiet Man cottage. Unfortunately the cottage is little more than a heap of stones, although it can be seen to be the cottage in the film. For years fans of the movie have petitioning the local council and the central government for permission to restore and preserve the cottage, and due to recent developments this looks likely to happen shortly. It can be located by putting this position 53.5076237,-9.5643968 into Google Maps. 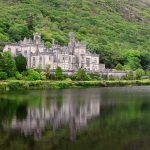 So why not while away a couple of afternoons hunting for these places which are in some of the most outstanding countryside that Connemara has to offer. 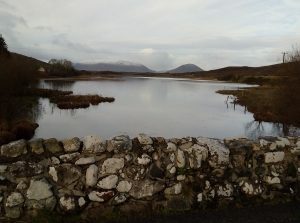 Stay in Renvyle https://cc-cottages.com/cottages-renvyle/ or Clifden https://cc-cottages.com/cottages-clifden/ as a good centre to visit these locations, or rent your own Quiet Man Cottage 186 Renvyle http://bit.ly/186Renvyle shoulddo the trick! 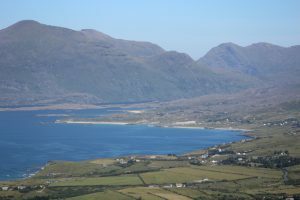 Renvyle today on the left, and John Wayne in the same spot in 1952. 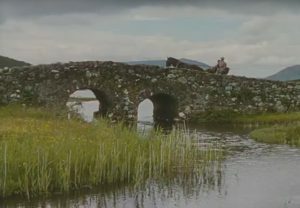 The Quiet Man Bridge, today on the left, and in the movie on the right. 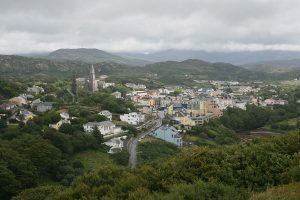 Clifden town today and a screenshot from the movie. 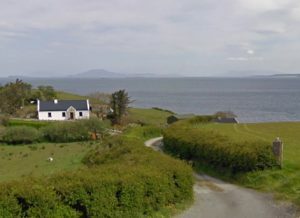 The “White O’ Morn Cottage Today and in the film.